In this dish, a mustardy chicken and mushroom pie-filling is topped with crisp, buttery crumble, laced with grated cheese and black mustard seeds. Put the chicken legs in a large pan with the onion, carrot, celery, bay leaf and peppercorns. Add the water, adding more if necessary to ensure the chicken is completely covered. Bring to the boil, skim, add a little salt, reduce the heat and leave to simmer gently for 40 minutes or until the chicken is tender and cooked. Strip the meat from the bones (discarding the skin), cut into small pieces, and reserve. Strain the cooking liquid and set aside 300ml. Meanwhile, prepare the crumble. 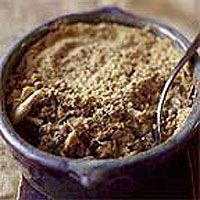 Mix together the two flours, then add the butter and rub in with your fingertips until the mix resembles breadcrumbs. You can do this in a food processor. Stir in the Parmesan, the mustard powder and seeds. Set aside. Make the sauce: melt the butter in a heavy pan and, as soon as it sizzles, add the mushrooms. Fry gently for about 10 minutes, until soft. Sprinkle with the flour and stir so all the buttery juices are absorbed. Add the 300ml chicken liquor and bring to the boil, stirring until it's smooth and thick and loses any raw flour taste. Add the mustard and cream and bring to a simmer again. Stir in the reserved chicken. Season. Put the mixture into a gratin dish. Leave to cool to room temperature. Meanwhile, preheat the oven to 200°C, gas mark 6. Top the chicken mixture with a generous layer of crumble. Bake for 25-35 minutes, until golden and crisp, and serve.